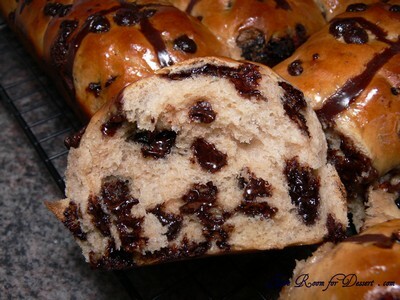 What’s better than store bought ones – Fresh Home-made Choc Chip Hot Cross Buns!! These are the best (almost) straight out of the oven, or at least on the same day as baking. The next day they are already not as fresh, and probably require being heated and/or toasted under the grill, with the addition of butter (if you so wish). 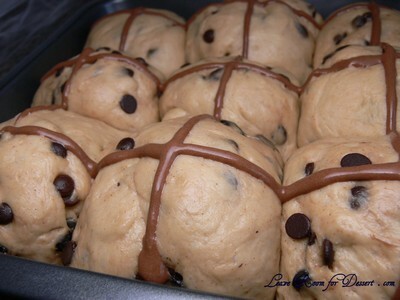 I thought I’d share this recipe before the Easter weekend for anyone wanting to make them. If the thought of waking up and smelling fresh fragrant hot cross buns sounds appealing and the thought of actually making them after waking up doesn’t sound as appealing – I’ve gone to the effort to test whether the mixture can be made the night before, with the second rising of dough done overnight in the fridge. The results: they did not rise as much as I had hoped overnight, maybe half the amount the normal batch did (not sure whether I was supposed to let it rise before putting in the fridge). After baking in the morning, they still hadn’t risen as much as the normal buns, although they had the same lovely flavour and texture – so I would recommend it if you are low on time for the morning. Enjoy and have a great Easter long weekend! Preheat oven to hot, 200°C. Lightly grease a 22cm square cake pan. 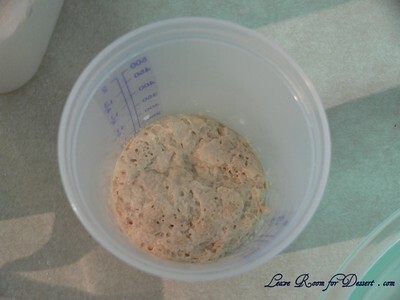 In a medium jug, combine milk, yeast and sugar. Leave in a warm place for 5-10 minutes, until mixture is frothy. Sift flour and cinnamon into a large bowl. Using fingertips, rub in butter until mixture resembles fine breadcrumbs. Stir through chocolate chips and sugar. Whisk egg into yeast mixture. 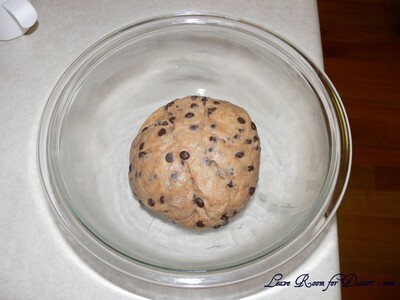 Add to flour mixture and mix to form a soft dough. Turn onto lightly floured surface. Knead 10 minutes, until dough is smooth and elastic. Place in lightly greased bowl and cover with plastic wrap. Stand in a warm place for 40 minutes, or until doubled in size. 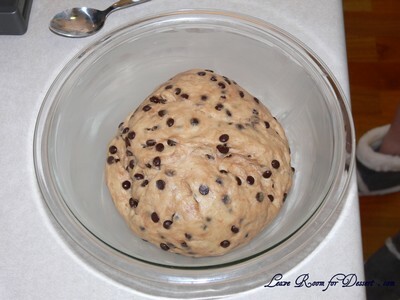 Punch dough down once with fist to release gas. Knead lightly. 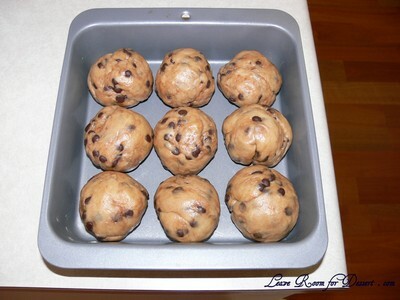 Divide dough into 9 equal pieces. Knead each piece until smooth. Shape into rounds. Arrange in pan. Cover with plastic wrap or a clean tea towel and stand 20 minutes, in a warm place, until doubled in size. 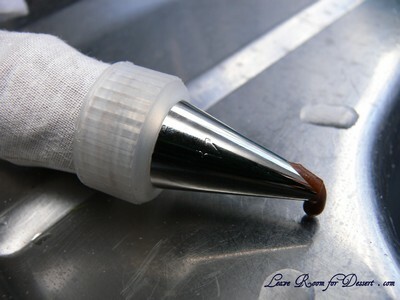 Crosses: in a small bowl, mix flour, cocoa and water to create a smooth paste. Pipe crosses on buns. Bake 12-15 minutes, until they sound hollow when tapped. Glaze: in a small saucepan, combine water and sugar. Stir over low heat for 2-3 minutes, until sugar dissolves. Bring to boil, without stirring. Reduce heat and simmer 1-2 minutes, until mixture thickens slightly. Brush over hot buns. Transfer to wire rack to cool. 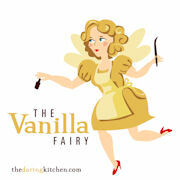 Filed under Cakes, Slices and Biscuits, Chocolate, Recipes. You can follow any responses to this entry through the RSS 2.0 feed. You can leave a response, or trackback from your own site. I can just imagine the smell of these in the morning! They look delicious! 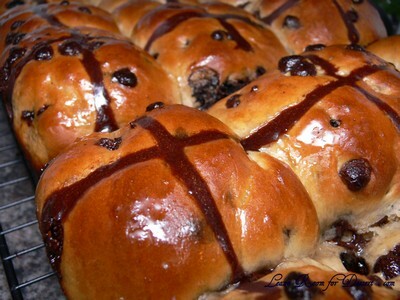 I love the smell of hot cross buns too, but I also enjoy a juicy sultana or two. 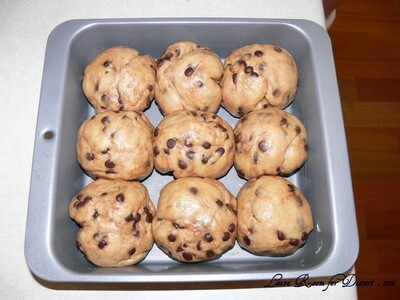 The choc chip ones would be awesome toasted if the chocolate melted, yum! 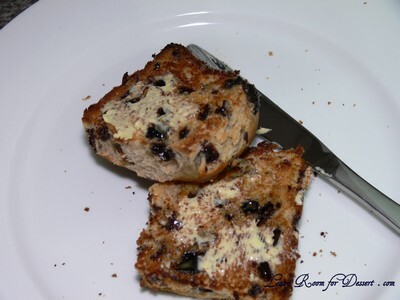 OMG, that’s a scrumptious version of Hot Cross Buns! These look sooo good! I can’t wait to eat some of these during the Easter break. Your HCBs look perfect, and I love the chocolate crosses. Oohh yuummmm! Yay for choc chip and I love how generous you are with the choc chips mmmmm! They tasted great too Anita 🙂 I just made the mistake of showing my darling husband your pictures and I think we may have to make them now too! Oh, they look so moreish. Yum! I had a fantastic Easter, the break was very nice and included a lot of cooking (and baking) and fixing up of my new place. 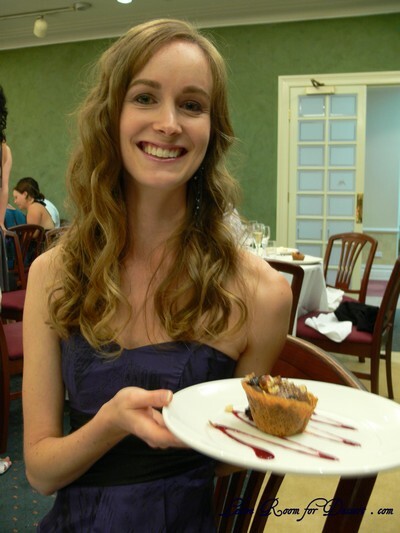 I hope everyone else had a fantastic Easter too and ate lots of great food! 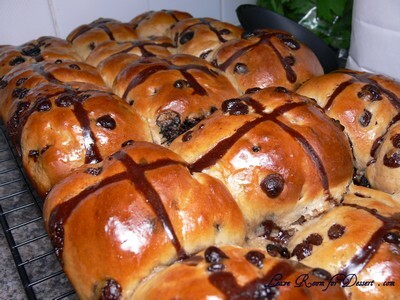 Wow – your Hot Cross Buns look amazing! Much prettier than mine which tasted good but were somewhat mis-shaped. I love the chocolate cross too – what a great idea. Oh yum! That looks so chocolatey!! !